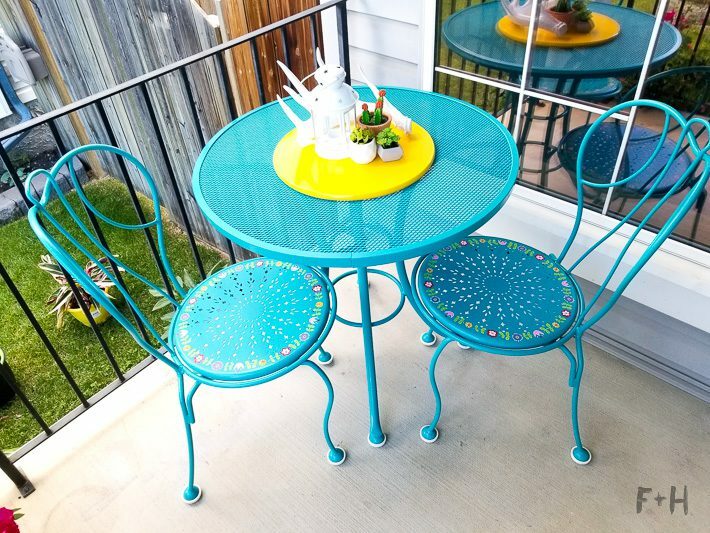 Now that summer is here and we are spending more time outside, it was time to update my old patio set. 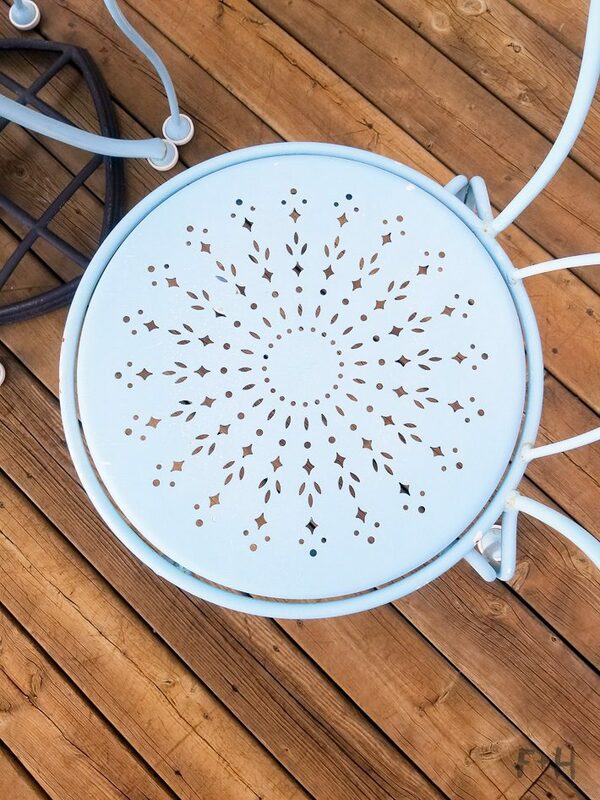 I got this patio set about 8 years ago when my husband and I were first married. We bought it from a golf course then came home & spray painted it baby blue. It was our first DIY project together as a couple. We’ve dragged it to two more houses since and over the years it’s gotten pretty weathered. I figured it was time for an update! 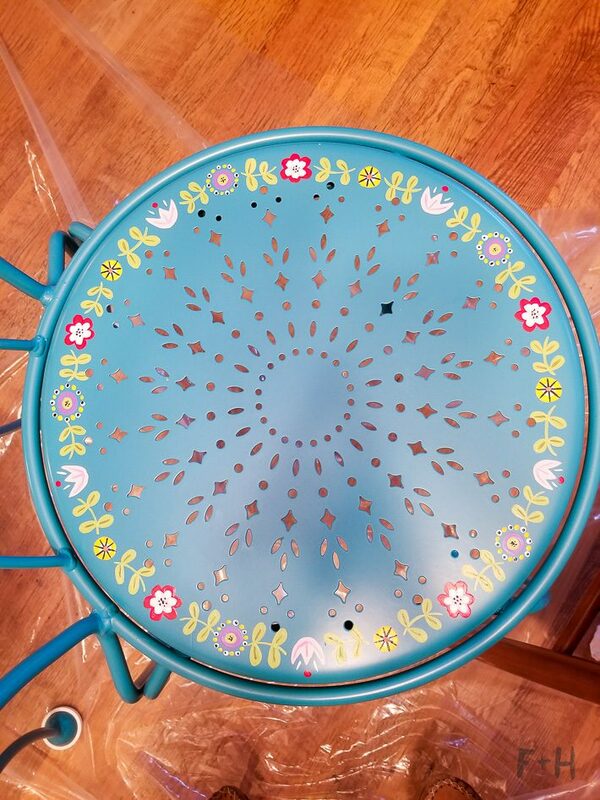 Afer some consideration I decided I still wanted a blue or turquoise shade, and to add a cute folk art flower border around the edge of the seats. I also wanted to take just the table and two chairs and add them to our front porch. 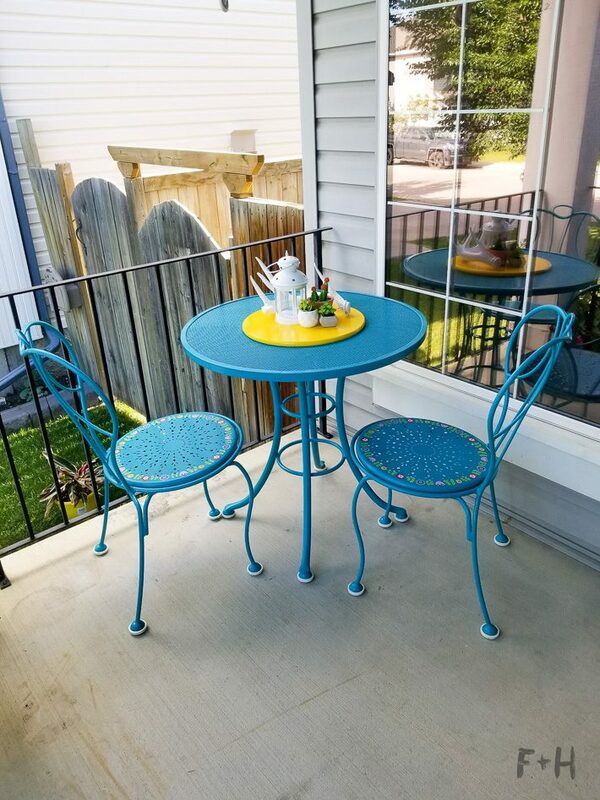 We really need a larger patio set for the back deck so this repurpose was perfect. 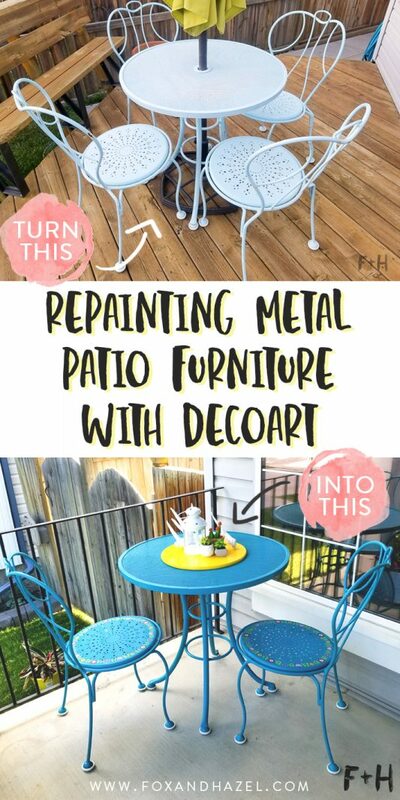 Repainting metal patio furniture can be done a few different ways. 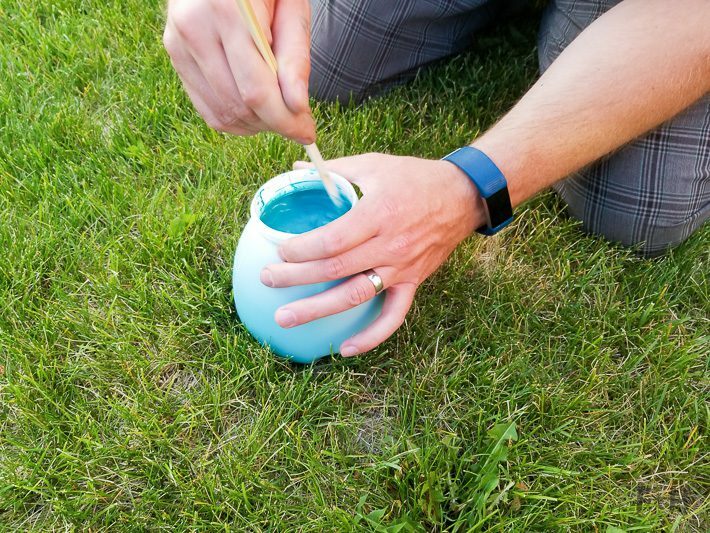 For this project, I decided to use Curb Appeal paint from DecoArt with a paint sprayer. I received a wonderfully awesome HomeRight Super Finish Max Paint Sprayer to complete this project. My husband had a different paint sprayer, but never used it because we were always disappointed with the coverage. 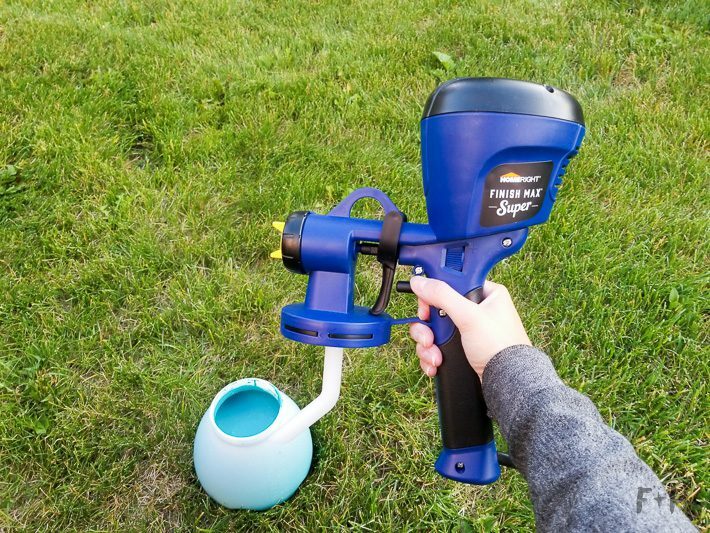 We were both very pleasantly surprised at how awesome this HomeRight paint sprayer turned out to be! 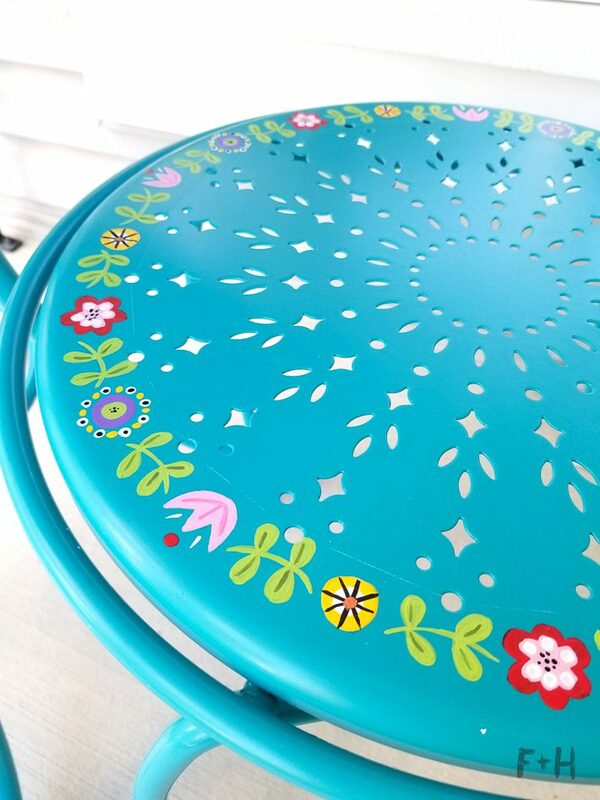 After using it for repainting metal patio furniture we plan to paint a few more things around the house! 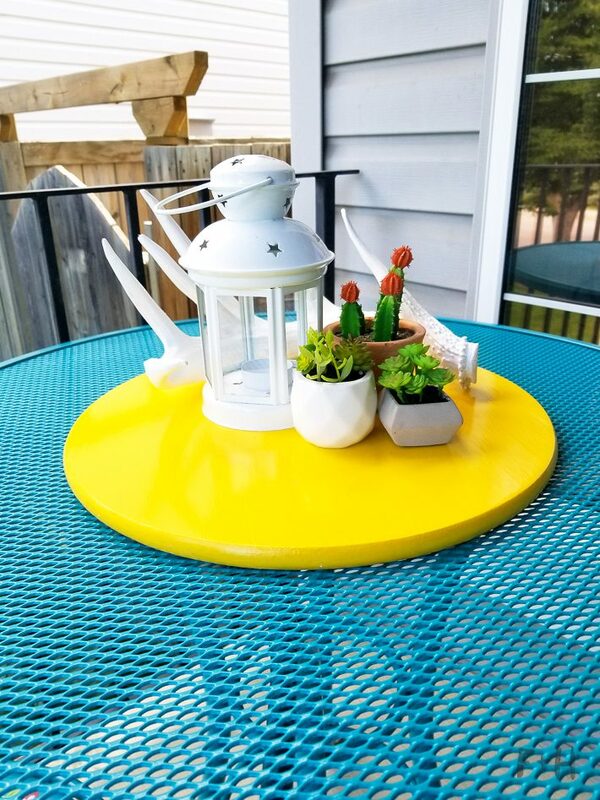 I used the Curb Appeal paint in Harbor Blue, as well as a selection of DecoArt Patio Paint Outdoor for the flower details. And one bottle of DecoArt Multisurface Satin because I forgot to get red & couldn’t find the Patio Paint at my local craft store. Spotfiy to keep me jamming while I painted! 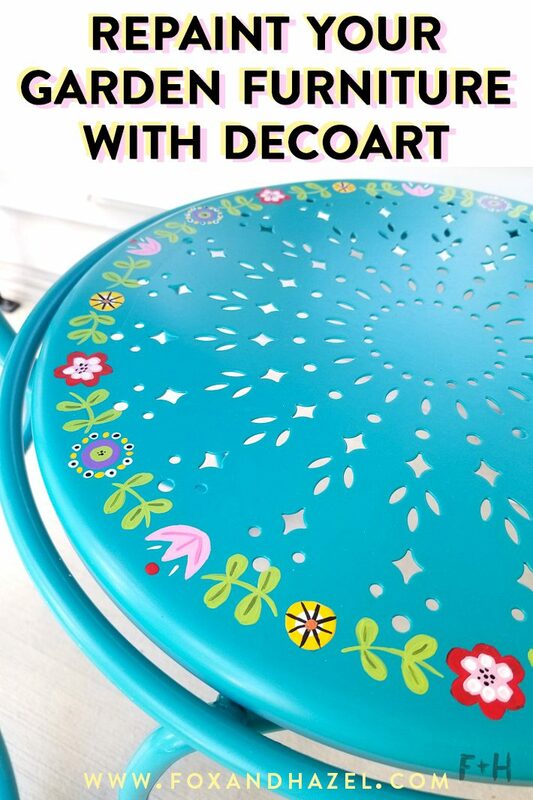 ALRIGHT, let’s jump into this and see how it is repainting metal patio furniture with DecoArt products! 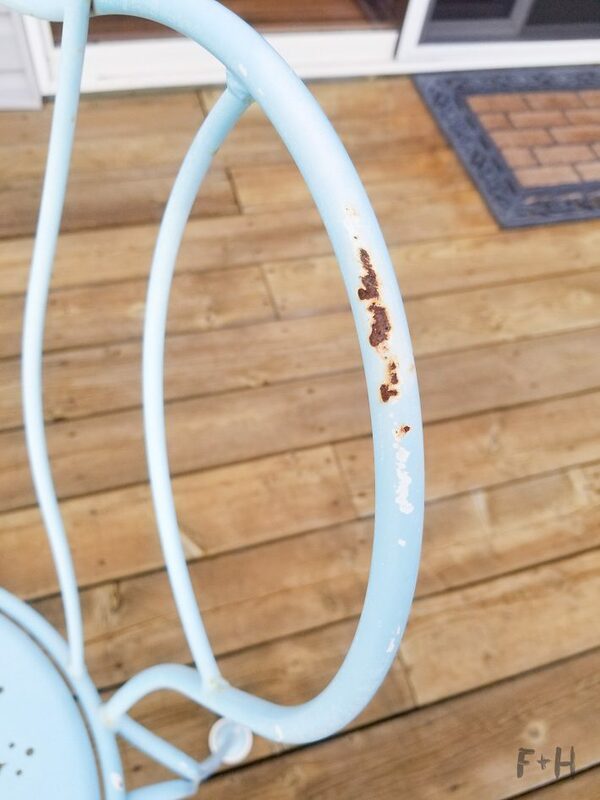 The paint had faded pretty badly over the years, and they were chipped all over with rust starting to show. Definitely needed a touch up! First, I decided to scuff up/sand my chairs before painting, mostly to ensure I got any loose paint that was flaking. 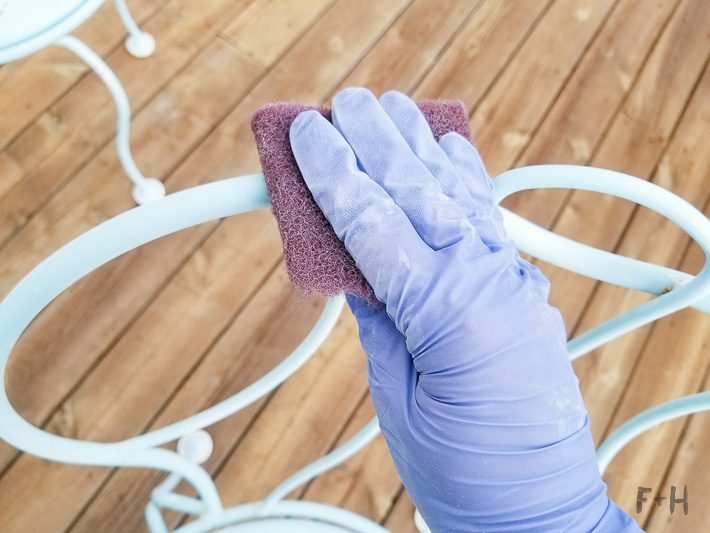 When you’re repainting metal patio furniture you want to ensure you prep your surface as best as you can. The better your prep job, the better your paint will adhere! 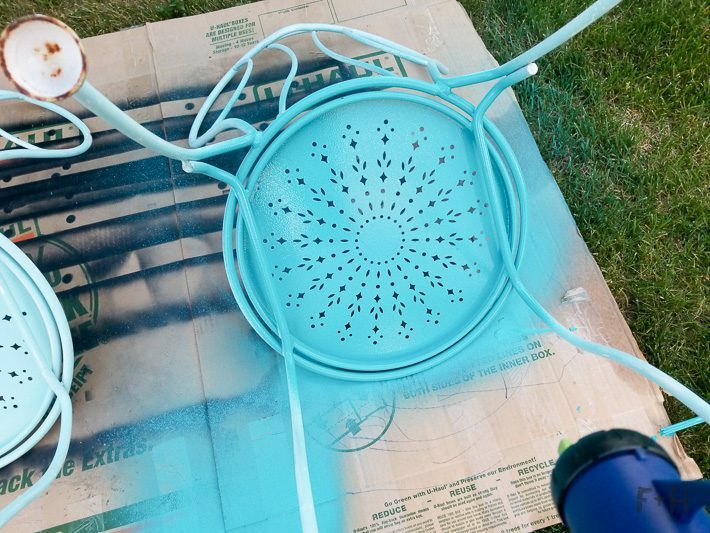 You could also prime your metal patio furniture with a Metal Primer if you’re concerned about rust. Curb Appeal doesn’t require you to sand your surface first, but I wanted to be extra sure the paint was going to stick! 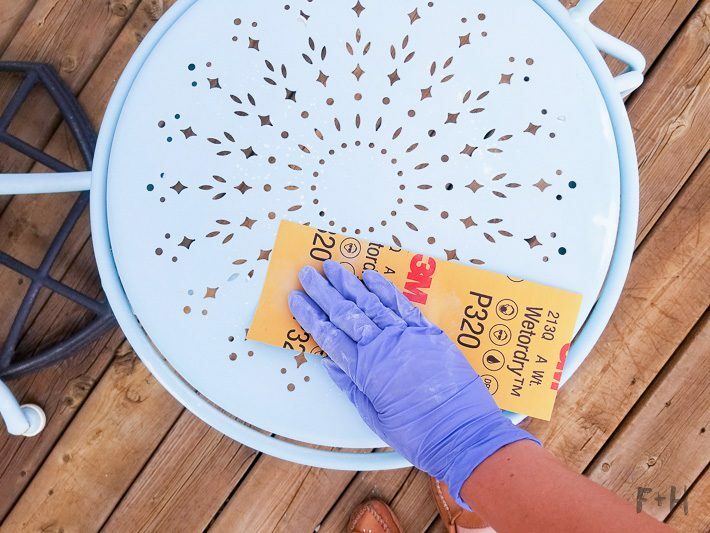 I used this auto body scuffing pad all over the chair and then used 320 extra fine grit sandpaper on the areas where the paint had chipped or was rusting. I wanted to smooth out those chips so they would be less noticeable under the new paint. After I had sanded it all and scuffed it, I wiped it down with a microfibre cloth to get rid of all the dust. Once everything was prepped, we set about prepping the paint sprayer and paint. (I need to apologize now for the less than stellar photos. Photographing large-scale DIY’s isn’t something I’ve done before or outdoor photos, so please bear with me through the not-so-amazing photos!) We diluted the Curb Appeal paint by about 40% with water to ensure it was super smooth for the paint sprayer. My husband helped me out on this part of the project because he has experience paint spraying before! 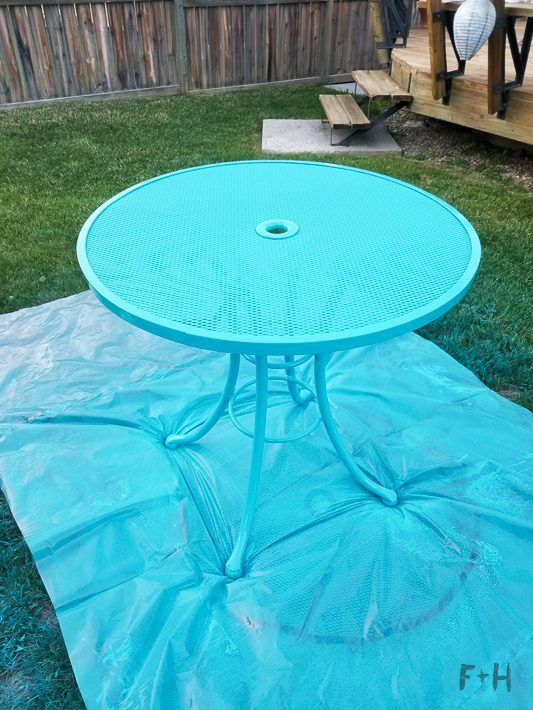 I highly recommend doing this type of paint project outside somewhere where you don’t mind getting overspray, and on a day that is not windy! We did this in our backyard one evening and will now be sporting blue grass for a few weeks. 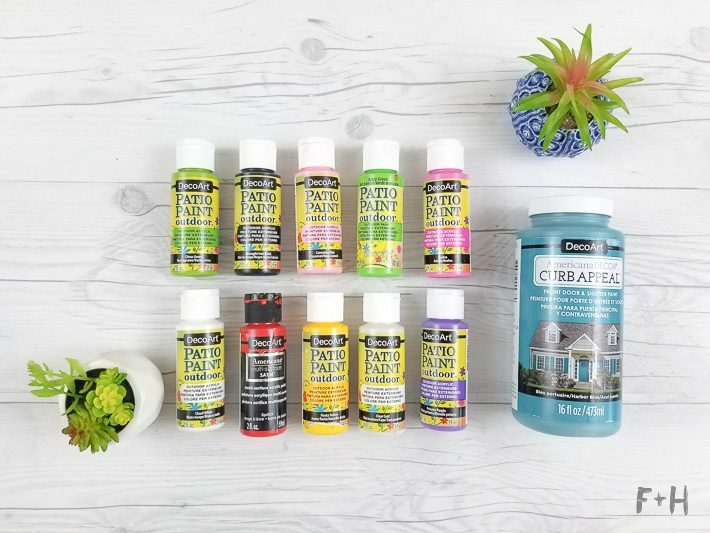 If you choose to paint inside your garage with a paint sprayer, then be sure to cover everything. The easiest way is to use some poly sheeting to tape over anything you don’t want paint on. Since we were in the backyard we used some leftover cardboard to set the chairs on top of. 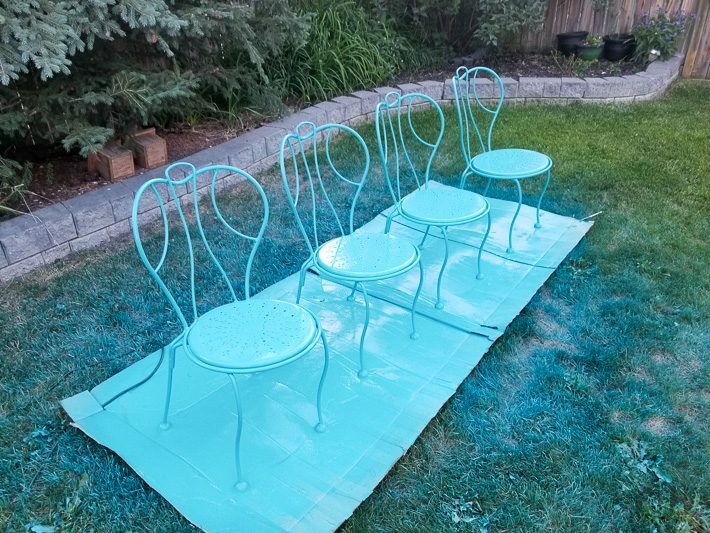 I ended up painting all 4 chairs since I had enough paint. We don’t need the other two chairs, so maybe we’ll try to sell them! Onwards to painting with this amazing HomeRight paint sprayer! 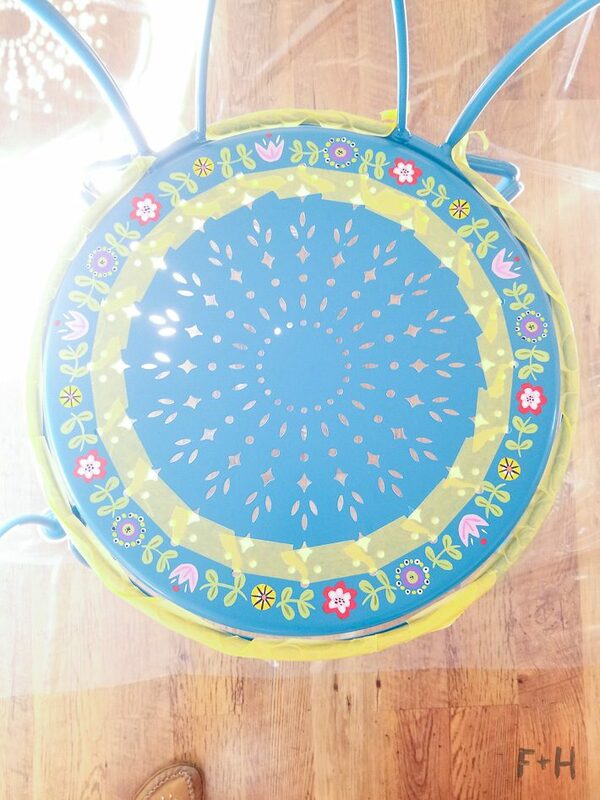 I painted the undersides of the chairs first, and then flipped them and finished the top. As you can see, there was a ton of overspray! 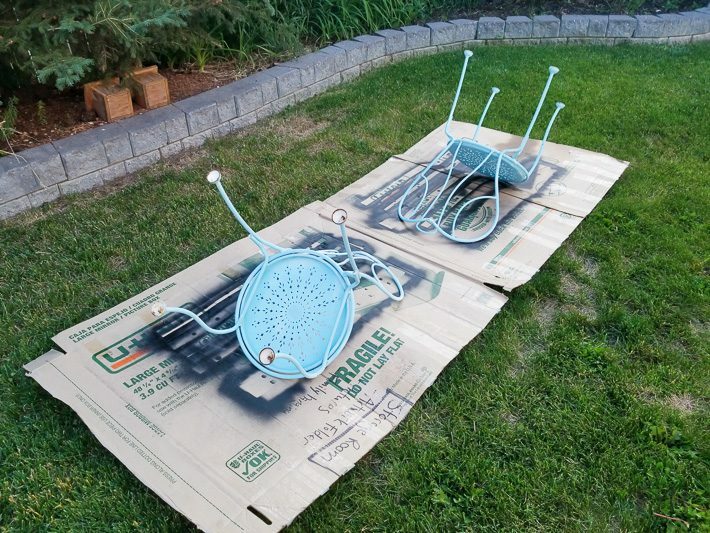 Because these chairs are really spindly, most of the paint ended up on the cardboard and grass. Confession: I think I may be addicted to paint spraying. It is so fun and satisfying to do! 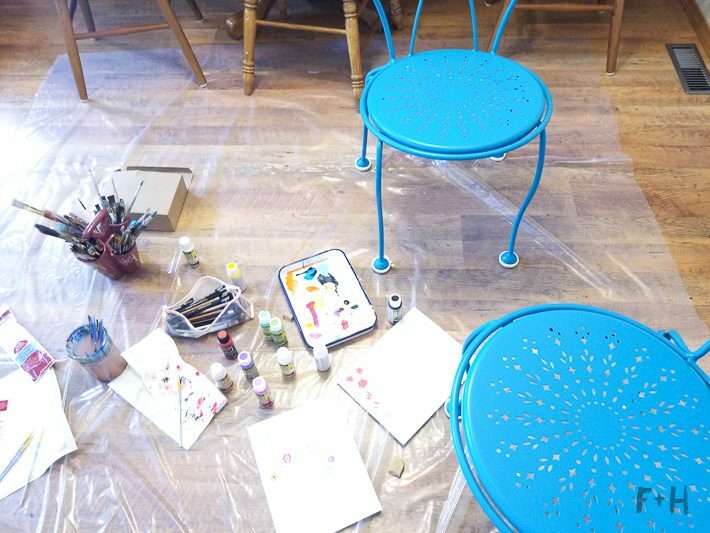 I had these chairs completely painted in about 10 minutes! And the Curb Appeal paint is so thick (even when thinned) that I only needed one coat of paint on everything! I love one coat of paint. Once the chairs were done, I moved on to the table! After everything was painted, I left it to dry overnight before adding details. 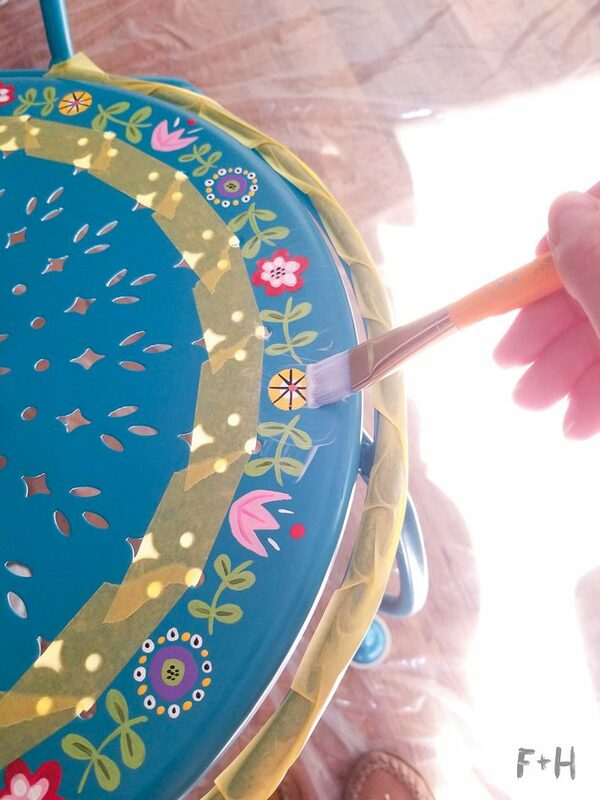 Now that the base color was done it was time for that cute folk art flower border! Again, the photos are not ideal as I was painting in my dining room rather than in my studio. Everything looks a bit too orange! This was my messy and chaotic set up below. I sketched out the pattern I wanted to create on the patio chairs first on paper, then marked out where each flower would go. Then just dove into it with my music going! 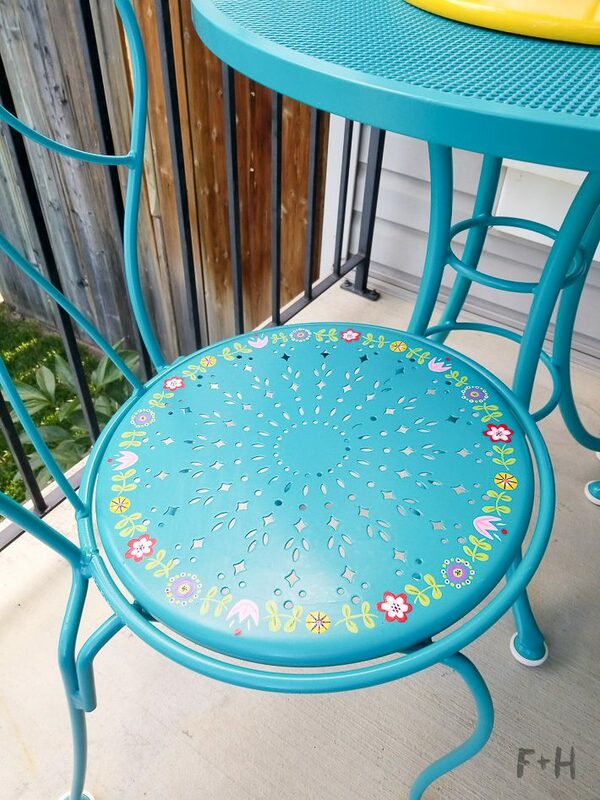 I did all of the bases for the flowers first on both chairs. After they were done I went back in and added details and the branches between the flowers. 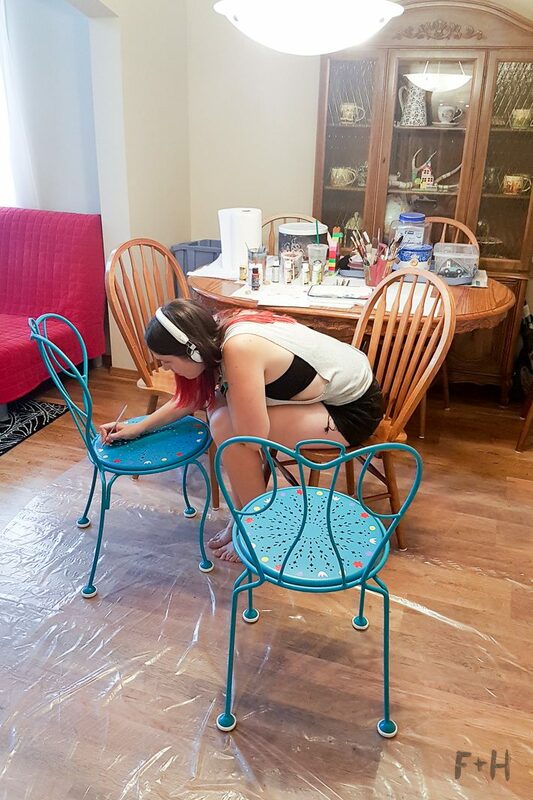 And here is a shot of me painting the chairs – my husband took this & thought it would be fun to share! I think this picture sums up the stuff a creative will do to paint or create – my back was sore that night! I let the flowers dry overnight to ensure they were very dry before clear coating. My husband taped off the chairs for me (because he “loves taping” that much!) 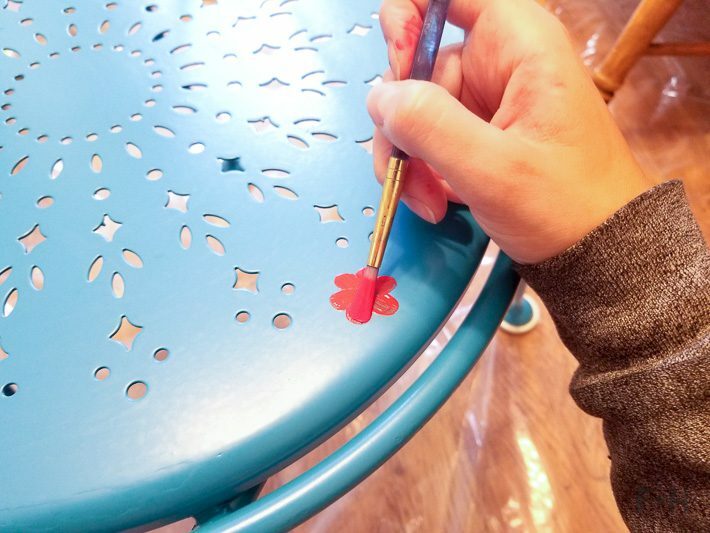 so that I could clear coat the flower designs. 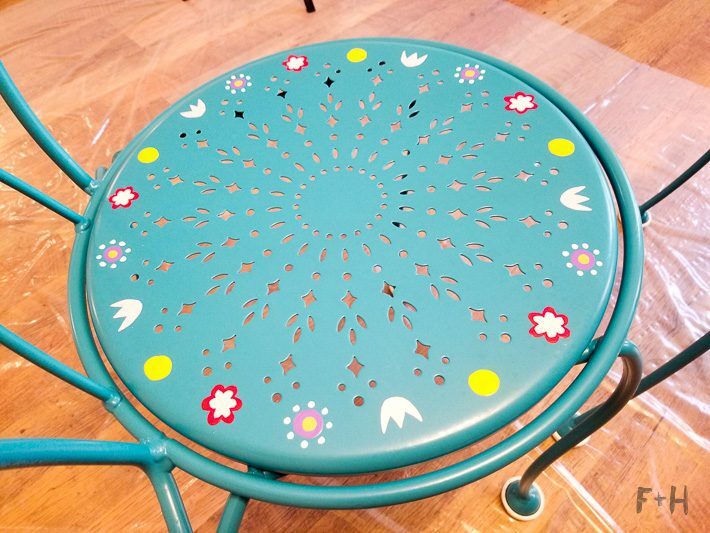 Initially, I wasn’t going to tape them, but I did a test on the underside of the chair and there was a slight difference in the finish with the clear coat. So we decided taping it would be better so I didn’t have to clear the entire seat. 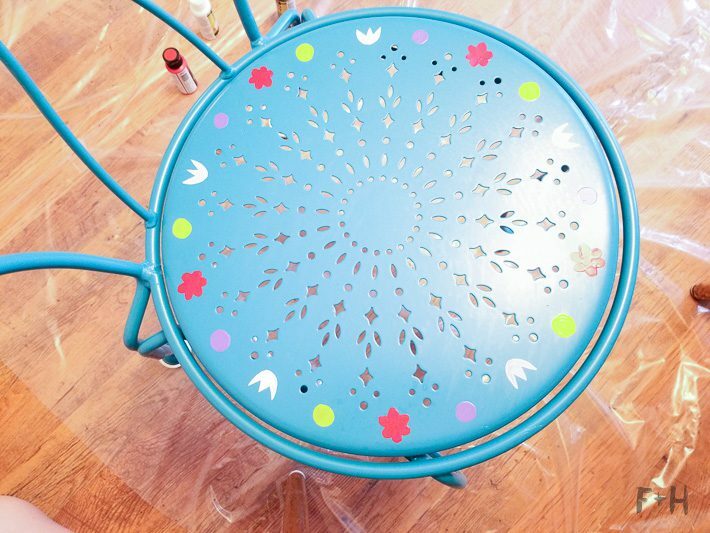 Once the clear coat was totally dry, the chairs were done!! These honestly turned out so much better than I expected them to. I wasn’t very confident in my vision for the flower border, but it came out so stinking cute! As soon as the clear coat had cured I moved everything outside and set it up! 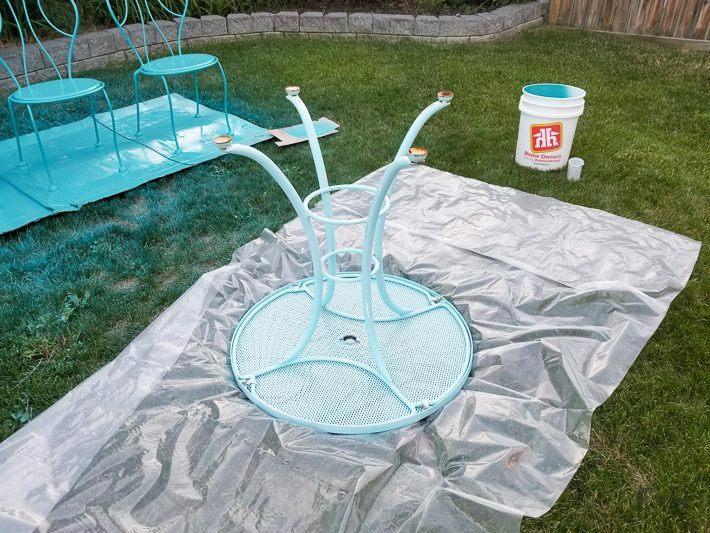 I hope you liked following along this adventure of repainting metal patio furniture! 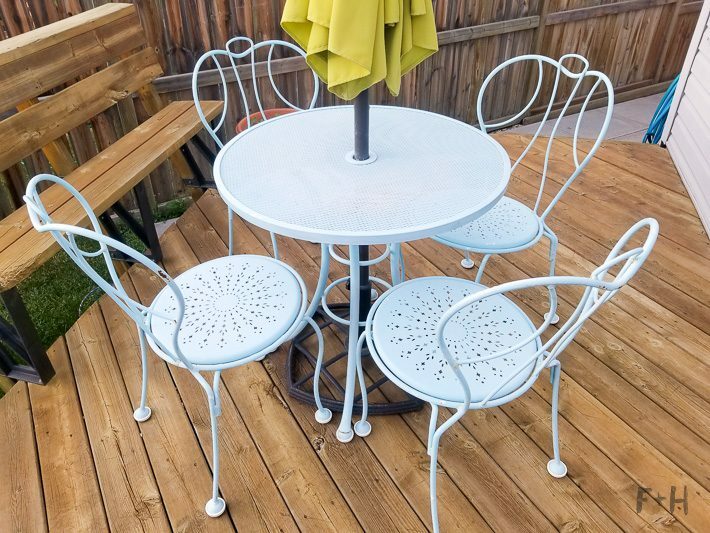 Now that the patio furniture is looking so cute it makes me want to drink my coffee out there in the mornings! We have big plans for the rest of the porch, which I’ll be sharing here too!